Ex-planning minister handed prison sentence in second trial probing deaths of 51 people in horrific 2012 rail crash. At the appointed hour the judge Pablo Bertuzzi read out the sentence, convicting Julio De Vido in the Sala AMIA of the Comodoro Py courthouse. It was short, to the point and hard-hitting. The former federal planning minister watched on from Marcos Paz prison (where he has been detained for the past year in another case), thus dodging an uncomfortable photo, one which would have shown him in the dock behind a screen, set against a backdrop of dozens of the families of the victims wearing T-shirts with the images of their loved ones, heralding their call for justice. De Vido now has his first court sentence – 68 months in prison. It arises from the second trial for the Once rail tragedy, in which 51 persons (one of them a pregnant woman) and 789 were injured. The former Federal Planning minister was convicted for defrauding public administration but not criminal neglect. The first trial was held between 2014 and 2015 and convicted 21 of the 29 defendants, without De Vido in the dock. The ex-minister was neither summoned nor indicted in the first investigation of the tragedy, whose two most senior defendants were the former Transport secretaries Juan Pablo Schiavi and Ricardo Jaime. But although the initial proceedings (under Federal Judge Claudio Bonadio and prosecutor Federico Delgado) did not include him, the moment the verdict was read, Federal Oral Criminal Court No. 2 (TOF) ordered his role in the rail tragedy be probed. Luck ran out for the ex-minister, who even started this trial as a free man but was behind bars soon afterwards due to other cases. De Vido’s absence the first time around was due to the lack of evidence (a point on which several relatives of the victims agreed) yet it was everything that emerged from that first trial which tipped the scales against him. Among the paradoxes of the Argentine legal-political scene, one of those most insisting on De Vido being summoned at the first trial was Gregorio Dalbón, a defence lawyer for Cristina Fernández de Kirchner but representing a victim’s family in this case. Following a series of warnings for verbal excesses including threats and mockery, Dalbón was kicked out of the courtroom. And so started the investigation with Delgado replaced as prosecutor by Ramiro González, who some months later ended up requesting the trials of De Vido and Simeonoff (head of the UNIREN watchdog for public service contracts at the time of the crash). 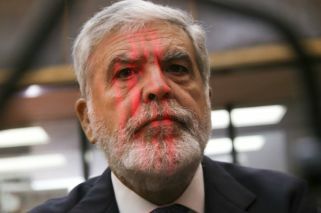 During the first trial the differences between Delgado and Bonadio became unsustainable, hence the former’s removal from the case in favour of González for the second probe. In May, 2016, three months after the TOF 2’s orders, Bonadio indicted De Vido as the “presumed co-author of the derailing as a necessary participant” in fraudulent administration, slapping a lien of 600 millon pesos on his assets. Three months later, the prosecutor González requested the trial of De Vido, considering him aware of the state of disrepair of the railway system yet responsible for not applying the corresponding controls and sanctions to those exploiting public transport at the time of the crash on the Sarmiento line. Outside the Comodoro Py courthouse, moments after the verdict, stood lawyer Leonardo Menghini, the uncle of young Lucas Menghini, whose body was the last found at the crash site.